If your cats are anything like mine as soon as they use the bathroom they want to hop on you and take a snooze but not before they get little cat little chunks all the way from the litter box to you, and on you. With a mat like this the cat litter stays by the cat litter box not on the floor or your furniture. I love that this is paw shaped very cute. The mat is available in three colors so you can match your decor. To clean we just take it outside and give a few wacks and the litter falls out and it is ready to be put back for more use. 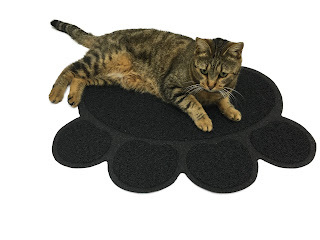 The Paw shaped cat litter mat can be found on Amazon. What The Cat Master has to say about their product. SOFTLY CATCHES LITTER: Our System Is the Precise Weave And Soft Material That Gently Brushes Your Cats Paws To Virtually Eliminate Litter Scatter Making A SOFT And EFFECTIVE Friendly Cat Litter Box Mat. The Cat Master Litter Mat is Made Out Of Tufted Fibers Are Thick, Soft & Flexible to Cushion Paws; Has No Bad Plastic Odors. 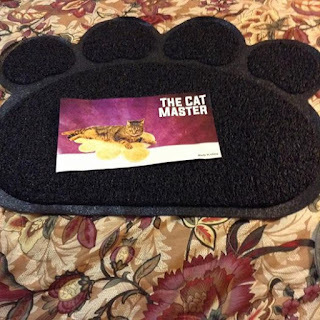 LONGER LASTING MATERIAL: We invested In Higher Quality PREMIUM MATERIAL So That Your New Master Cat Litter Catcher Mat Will Last Years Or Several Thousand Meow Flushes. Test Our Litter Trapper Mat Against Other Cat Litter Mats On The Market. Disclosure: MarksvilleandMe received one or more of the products mentioned above as part of a promotion with Tomoson and The Cat Master. Regardless, MarksvilleandMe only recommends products or services we use personally and believe will be good for our readers. Some of the links in the article may be “affiliate links.” This means if you click on the link and purchase the item, I will receive compensation. If you would like MarksvilleandMe to review a product or service please contact us at marksvilleandme@gmail.com.